Join the Kurganov-Finehouse duo for an exploration of music with magical and mystical origins. From Ernest Chausson’s Poeme, based on Ivan Turgenev’s story about a magical violin used to charm one’s beloved to Olivier Messiaen’s Theme and Variations, a living depiction a strange, transcendental, and supernatural powers, this unique program will not disappoint. Formed in 2015, the Kurganov-Finehouse Duo has been lauded by FanFare Magazine for “smoldering intensity…Kurganov’s and Finehouse’s recital brings together a wide variety of styles, rendered with an effervescence and panache”. 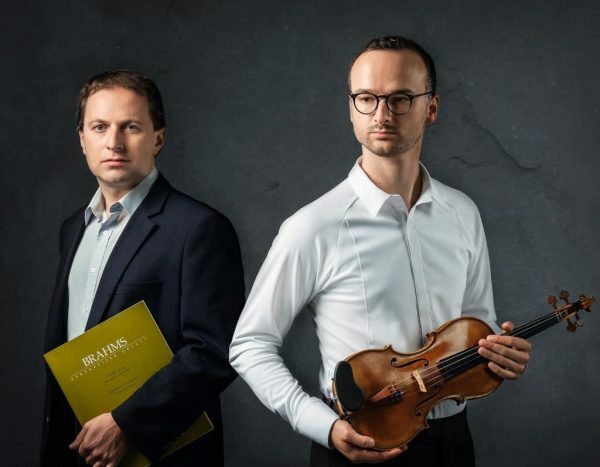 In 2018, they released their debut album as a duo, “Between the Notes: Music for Violin and Piano” featuring music of Brahms, Prokofiev, Tchaikovsky and others to positive reviews. Artsfuse called it “…a tour de force performance, superbly impassioned.” Recent performances include an artistic residency at the Museum of Fine Arts and performances and with the Essex Chamber Players. In Spring 2019, the duo will tour China. Praised by Rhein Main Presse Allgemeine Zeitung for his “interpretations of depth and maturity,” Constantine Finehouse has performed extensively in the US and abroad. His album with cellist Sebastian Baverstäm features music by Brahms and Boston composer Tony Schemmer. His 2009 solo release, “Backwards Glance,” interweaves works by Brahms and Richard Beaudoin. “The Bolcom Project”, made in collaboration with with his American Double partner, violinist Philip Ficsor, included an Albany Records 2-CD album and a national tour with concerts in Boston, New York, Denver, Santa Barbara, Spokane and at Yale University. Fanfare praised the recording as “indispensable to any serious collector with an interest in later 20th-century duo repertoire for violin and piano.” 2018 will see the premiere of Bolcom’s Horn Trio with Ficsor and Steven Gross, a work commissioned by the group. Finehouse’s recording of Bolcom’s piano solo works for Naxos Records was released earlier this year to excellent reviews. During the recent seasons Finehouse has performed at the Mozarteum (Salzburg), Miaskovsky Hall (Moscow Conservatory), Merkin Recital Hall, Weill Recital Hall (Carnegie Hall) and Jordan Hall (Boston), as well as at Harvard, Yale, and Emory universities, and St. Vincent’s and Elmira colleges, among others. With degrees from Juilliard and Yale, Finehouse teaches at New England Conservatory, and serves as Visiting Artist/Faculty at Westmont College, CA. Seating will be recital-style (no tables).